This unusual and interesting name is mainly an occupational surname for someone employed at or with some connection with, the largest and most important building in the settlement. This may have been the local "great house" of a nobleman or the landowner, or a religious house, a monastry or convent. In some cases the name may have referred to a "householder", someone who owned his own dwelling as opposed to being a tenant. In the Middle Ages most of the population lived in huts or cottages rather that houses. The derivation is from the Old English pre 7th Century "hus", house and there are a number of variants existing today:- "House, Howse, Hoose and Hows". 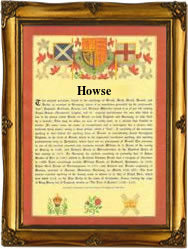 One "Joseph Howse" was an early emigrant to the Barbadoes, leaving London on the "Alexander" in 1635. The first recorded spelling of the family name is shown to be that of Simon Hus, which was dated 1226, in the Eynsham Cartualry, Oxfordshire, during the reign of King Henry 111, known as the Frenchman, 1216 - 1272. Surnames became necessary when governments introduced personal taxation. In England this was known as Poll Tax. Throughout the centuries, surnames in every country have continued to "develop" often leading to astonishing variants of the original spelling.